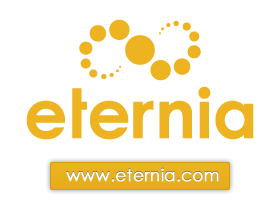 Eternia Project - The future-oriented Personal Network: store your identity forever and act in the future by means of tangible and intangible services. Eternia Project stems from a dream of its founder: «To re-think Man's identity in the future». It is the workshop of ideas and studies in relation to the impact that immortality and actions into the future will have on everyday life. To assure immortality, protection, perpetuation and appreciation of data, for both the individual Eternia user and also in a more collective perspective of humanity. To improve life by persistently studying, experimenting and realising new possibilities for the future and immortality through the potential of innovative technologies. To develop and build social projects that fully benefit from Eternia's potential, with real usable and support contexts available to certain types of disadvantaged users. Eternia is basically the physical place where these considerations become reality. you can store your most important contents and pass it on to the people that matter, beyond the limits of your own existence. share contents with your most important relations, and also with people who yet aren't born. plan future deliveries of messages to the persons you love, by means of tangible and intangible services. make your own life experience part of the history of Mankind. We just finished exhibiting at stand number D329 in the Downtown Area on Day 1 of the event, Tuesday, November 3.